Health-Option can aid you in providing an effective Hearing Conservation Program for your Company. Under CFR 1910.95, you have an obligation to administer a continuing, effective hearing conservation program whenever employee noise exposures equal or exceed an 8-hour time-weighted average sound level (TWA) of 85 decibels measured on the A scale (slow response) or equivently, a dose of 50%. Referral of employees for speciality care, if indicated. 1) Through our national network of occupational health clinics, we can facilitate audometric testing at a site closest to your units. 2) We provide a standardized audometric history and testing form. After the hearing test is completed, the form is faxed back to HealthOption for review by our occupational health physician. 3) The Company receives a master list of audiograms obtained, which identifies any employees who have incurred a standard threshold shift (as defined by O.S.H.A.). The audiogram results are categorized; ranging from normal hearing, mild loss, significant loss, and profound hearing deficit. 4) An individual report is prepared for each employee tested, which depicts his/her current audiogram, plus a paragraph or two discussing the implications of the testing result. O.S.H.A. 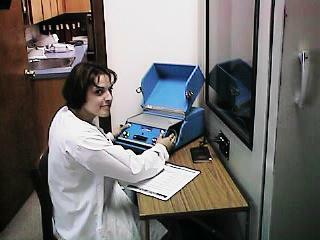 mandates that emloyees be notified of the results of their audiogram within 21 days of testing. 5) A 15 minute video is available for annual instruction of the employee which describes the use of appropriate hearing protective devices, the testing process, the pathology of noise-induced hearing loss, and suggestions for personal hearing protection. We charge $18.00 per audiogram for review, processing and reportage. Nationally, the cost for obtaining an audiogram ranges from $8.00 to $20.00, with an average of $12.00 per test, depending upon the location of the testing facility. Please allow 2 weeks for scheduling.